These subscriptions offer any educational establishment (with more than 5 members of staff) the ability to licence Microsoft products per FTE (fulltime employee working over 200 hours per year) rather than per station on an annual subscription basis, so it's an awful lot cheaper AND you can use the latest software. In previous subscription schemes like Campus and Schools agreements customers needed to licence all products for all stations/FTEs. With EES and OVS-ES Microsoft are introducing the concept of 'additional' products. This means if an establishment wants to use something like Microsoft Visio on 10 machines, you only need to licence 10 stations. To discuss your needs regarding the EES/OVS-ES, please call Precedence Sales 08456 446800. 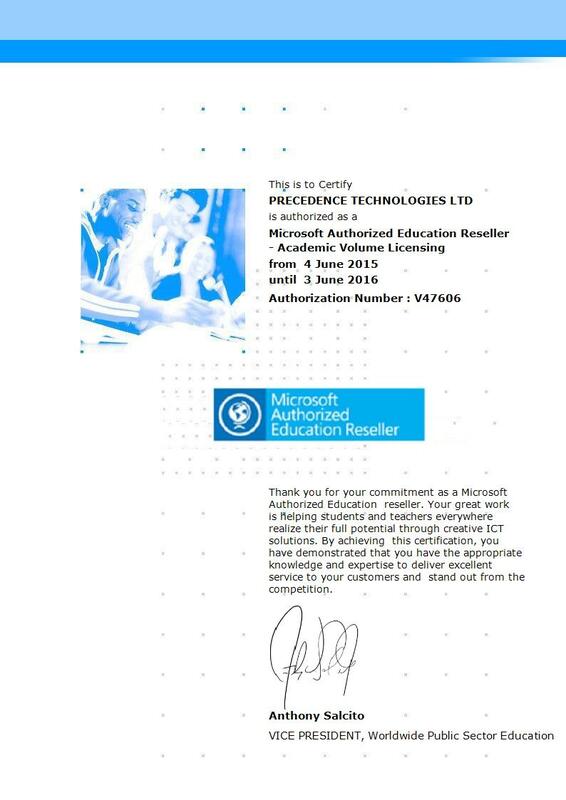 Precedence Technologies is an Authorised Education Reseller (AER). Please click below for our certificate.